Obesity is associated with cardiovascular morbidity and mortality. This quantitative CMR perfusion study aims to examine the contribution of body mass index (BMI) to decreased myocardial perfusion reserve (MPR). 123 patients with no obstructive epicardial coronary artery disease, defined by coronary computed tomographic angiogram demonstrating < 30% stenosis, underwent regadenoson CMR 1st-pass perfusion imaging, using 0.05 mmol/kg gadolinium (Gd) followed by rest perfusion imaging (also 0.05 mmol/kg Gd) performed 20 minutes later. The subjects were categorized into 4 groups: normal BMI (between 18.5-24.9 kg/m2, overweight (BMI 25-29.9 kg/m2), Class I obese (BMI 30-34.9), and Class II and III obese (BMI≥35). Myocardial blood flow (MBF) in ml/min/g and myocardial perfusion reserve (MPR) were quantified using a fully quantitative model constrained deconvolution. 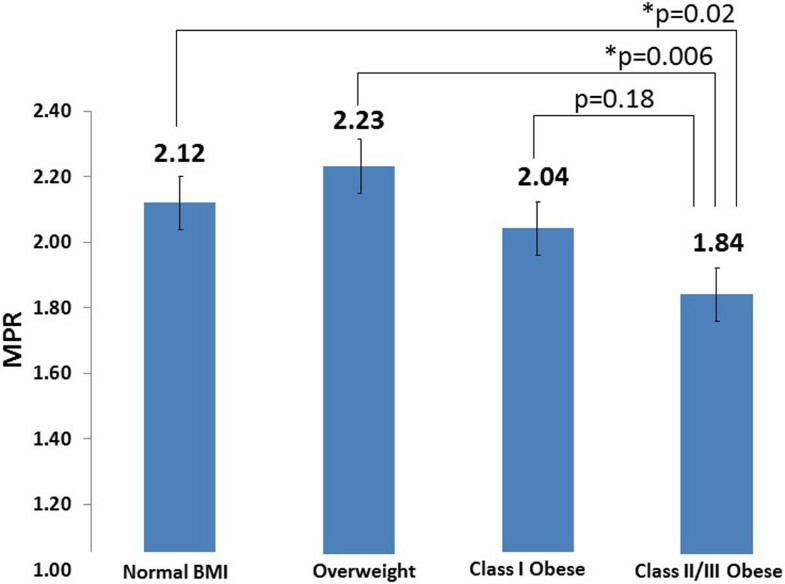 The normal BMI group had 25 patients (mean BMI 22.8 ± 0.3), the overweight group had 52 patients (mean BMI 27.4 ± 0.2), the Class I obese group had 22 patients (mean BMI 32.1 ± 0.3), and the Class II/III obese group had 24 patients (mean BMI 42.7 ± 1.1). MPR in the four groups was: Normal 2.12 ± 0.09, Overweight 2.23 ± 0.09, Class I Obese 2.04 ± 0.13, and Class II/III Obese 1.84 ± 0.11 (Figure 1). MPR was statistically higher in the Normal and Overweight groups compared to the Class II/III Obese group (p = 0.02 and 0.006 respectively). Class II/III Obese subjects have a statistically significantly lower MPR compared to Normal BMI and Overweight groups. Even in the absence of obstructive coronary artery disease, Class II and III obesity is associated with decreased MPR as demonstrated by CMR quantitative measurement of regadenoson-rest perfusion.